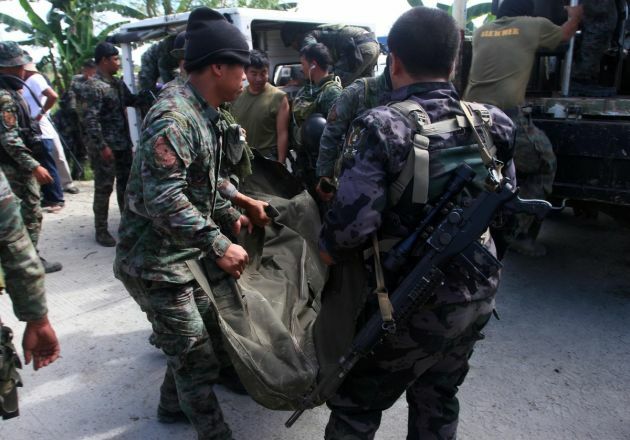 (Photo: REUTERS / Stringer)Philippine National Police (PNP) carry a body bag, containing a member of the Special Action Force, to a van in Mamasapano town, Maguindanao province, January 26, 2015. At least 30 people were killed in heavy fighting between police and Muslim rebels in the Philippines on Sunday, military and local officials said, threatening a year-old peace agreement and shattering a ceasefire that held for three years. The Canadian Prime Minister Justin Trudeau has condemned the killing of a Canadian hostage kidnapped by Islamist extremists in the Philippines as "an act of cold-blooded murder." John Ridsdel, 68, who worked in Philippines as a mining consultant, was taken from a tourist resort with three others by the Abu Sayyaf group in September 2015, the BBC reported. "Canada condemns without reservation the brutality of the hostage-takers and this unnecessary death. "This was an act of cold-blooded murder and responsibility rests squarely with the terrorist group who took him hostage," Trudeau told journalists after a meeting of Canada's cabinet. In November, the Islamists released a video showing Ridsdel and three other captives, and demanded a ransom of $80 million. Ridsdel was taken to Jolo after being kidnapped from a marina near the city of Davao, along with another Canadian, Robert Hall; a Norwegian, Kjartan Sekkingstad; and a Philippine woman, Hall's girlfriend, Marites Flor. Later Ridsdel warned in a video released by the group that they would kill him on April 25 if no ransom was paid. "The government of Canada is committed to working with the government of the Philippines and international partners to pursue those responsible for this heinous act," said Trudeau. "The government of Canada is committed to working with the government of the Philippines and international partners to pursue those responsible for this heinous act." He did not respond when asked whether the Canadian government had tried to negotiate with the captors or pay a ransom, or whether it was trying to secure the release of the other Canadian being held, Robert Hall, Reuters reported. Ridsdel's family said in a statement that his life being "cut tragically short by this senseless act of violence despite us doing everything within our power to bring him home" had devastated them. Abu Sayyaf is one of smallest but most radical of Islamic separatist groups in southern Philippines and its name means "bearer of the sword" in Arabic. With a membership believed to be in the low hundreds, it hived off from the bigger Moro National Liberation Front in 1991. The group agitates for the creation of an independent Islamic state in mostly Catholic Philippines, and engaged in hostage-taking and bombings to pressure the government. It was once linked to al-Qaeda, but its leaders have said they are allied to Daesh which is sometimes called the Islamic State.